Tea last night was an invention test as I have a big bush of sage growing in the garden and I wanted to make use of it! 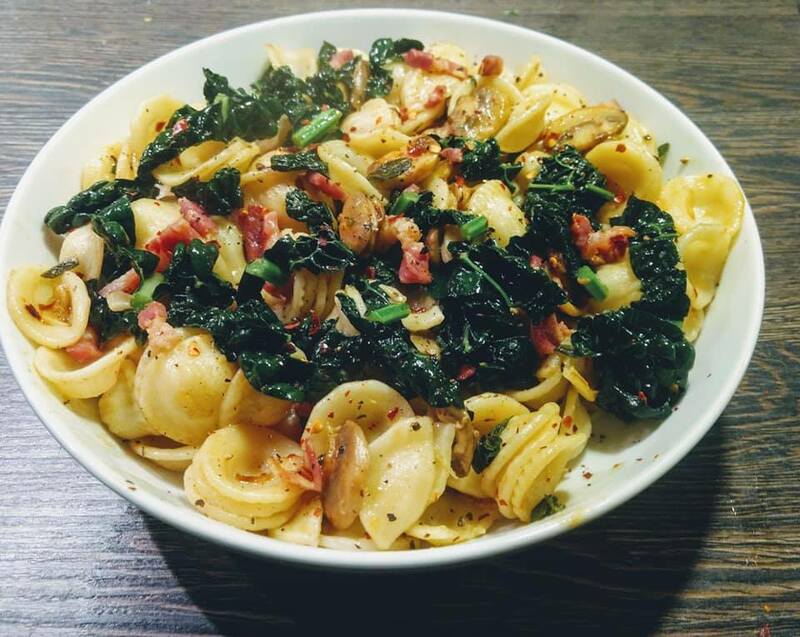 Sage isnt a herb I cook with often but I opened the fridge and found hal;f a pack of pancetta and some cavolo nero that I didnt know what to do with and a dish was born! I really loved this and will definately make it again therefore I am sharing it on here before I forget how to make it! I could have choosen another type of pasta but I really like Orecchiette ( little ears!!) as it scoops up the sauce and filling nicely. You could make a vegetarian version of this dish by substituting the pancetta for roasted squash pieces and I think that would go really well. While the pasta is cooking, in a small frying pan very gently heat the garlic in 2 tbsp of olive oil making sure it doesn’t go brown, after 3-4 mintes add the sage leaves, lemon thyme and chilli flakes and warm again for a few minutes and then set aside. Drain the pasta but retain a bowl of the cooking water to make your sauce. In a large frying pan, heat a splash of oil and then fry the pancetta until almost cooked before adding the mushrooms and cavolo nero/kale. Carry on frying for a few mintes until the mushrooms and greens are soft then combine with the pasta and garlic and herb oil. Add grated lemon zest and juice, salt and black pepper, a knob of butter and a few tablespoons of the reserved cooking water from the pasta and warm in the frying pan until everything is piping hot. Serve with grated parmesan cheese on top and garlic bread!